In this Webcast, Dr. James Steenburgh, working for the Department of Meteorology and the NOAA Cooperative Institute for Regional Prediction at the University of Utah, takes a look at cool-season orographic storms in western North America. 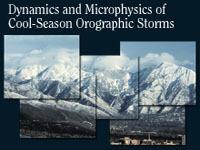 He provides a brief microphysics review, an overview of cool-season orographic precipitation processes in several mountain ranges, and a look at forecasting tools and techniques. This Webcast is based on a classroom presentation given in Boulder, CO in December 2002. Great lesson on mountain topography and it's impact on forecasting. Very interesting material presented. It was a very well structured course for precipitation and orographic influence on meteorological phenomena. If you already have prior training or study with this material, it will be easier for you to grasp. The instructor sped through a lot of lessons and unless you caught on to something quick, you would be lost. Overall, it was a fair experience. The learning material is too dense. More in-depth and slower explanations are required to effectively learn the lesson content. Great overview of snow processes and the challenges associated with forecasting orographic precipitation events in the Western US. • Improve knowledge of orographic precipitation processes and their geographical, climatological, and storm-to-storm variability. • Build or enhance your orographic precipitation forecasting tool chest. • Illustrate the strengths and weaknesses of quantitative precipitation forecasts by high-resolutions models in complex terrain.